The very exclusive and private equestrian community of Mallet Hill lies in the heart of world-famed equestrian destination locale, Wellington, Florida. Situated within walking distance of the Palm Beach Polo and Country Club, residents of Mallet Hill enjoy being close to the action during the internationally acclaimed, Winter Equestrian Festival, whose show grounds are literally down the street. As one would expect from such a distinguished vicinity with an appreciation of all things equine, the Wellington area boasts incredible equestrian related amenities. Instruction and training facilities for all of the major equine disciplines are available as well as top-notch equine medical care, endless miles of riding trails and bridle paths, and stabling and paddock facilities and much more are all within an easy drive. Mallet Hill’s Wellington location provides access to all the creature comforts discriminating homebuyers are looking for. A-rated schools, shopping at the beautiful Wellington Mall and the areas’ high-end boutiques, arts and entertainment events and some of the finest dining to be found in South Florida are all part of living the Wellington lifestyle. Some of the world’s most stunning beaches are minutes away and the numerous wildlife sanctuaries and nature preserves add to the unique tropical environment residents have come to love. Mallet Hill’s proximity to the Florida Turnpike, I-95 and the Palm Beach International Airport make travel to other locales a simple proposition as well. 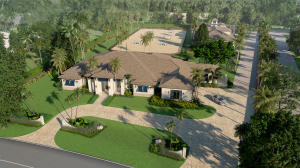 Nineteen homes dot the immaculately manicured lush and tropical grounds of Mallet Hill with most occupying five acre lots with private horse stalls. Homes are of the highest of quality and feature elegant and unique exteriors and interiors befitting of this high-end tier of construction and design. Many residences contain superior upgrades and amenities such as marble and ceramic floors, vaulted ceilings, stunning fireplaces, French Doors, gourmet kitchens, generous master suites and roman tubs. Private resort-style pools, outdoor kitchens and shimmering water features are frequent sights in the yards of Mallet Hill residences and further the extraordinary experience and lifestyle residents of this very special community have come to know and love. Search for Mallet Hill listings in Wellington, Florida. We've created convenient search filters that make finding your new home online quick and easy. You can sort through the MLS listings by city and subdivisions. If you want to create your own custom search settings, try using our Advanced Search. For more information about buying or selling property in Wellington, contact Harold or Linda Wellman of The Wellman Team today and see why we are the local favorite in Palm Beach County for the past 25 years.